Did you know "pilaf" is rice cooked in a seasoned broth? For this recipe you can use any type of broth you'd like. You could also use water to cut down on sodium even more. 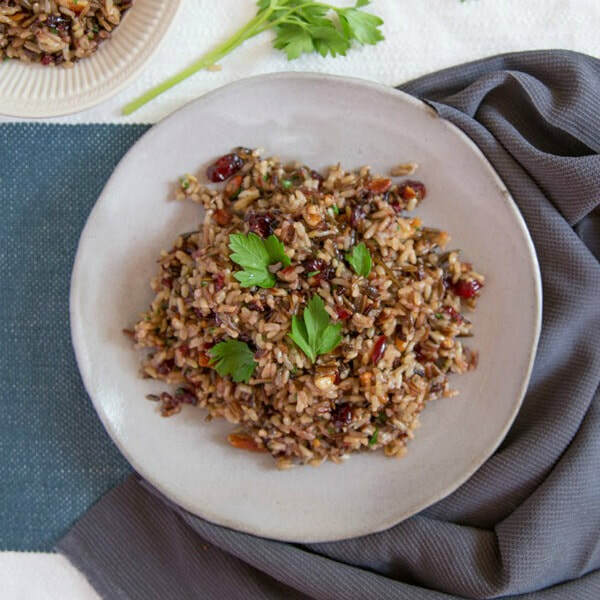 Using brown rice instead of white rice adds fiber and other healthy vitamins and minerals. Spray the large skillet with canola cooking spray. Heat skillet over medium heat. Sauté onion and celery until tender, about 5 minutes. Add brown rice and sauté for 5 minutes. Add water, broth, and raisins; heat to boiling. Reduce heat to low, cover and simmer until rice is tender and liquid is absorbed, about 50 minutes. Stir in walnuts if desired, sage, salt and pepper.